I’ve been sorting through the various seed packets we bought for this spring… also the seed packets from previous years that we keep in the freezer… and trying to plan when I needed to plant what. Somewhere in this process I realized it would be easier to just make a chart. The germination and growing information in this chart comes from the seed packets of the varieties of vegetables that I grow each year in our zone 4 garden. My favorite seedlings are always the tomatoes. We like to try a few new heirlooms every year in addition to all our old favorites, and I think my farmer’s soul would have to grow at least some tomatoes even if we didn’t grow anything else!!! This is really going to be helpful to me. I am almost ready to plant tomato, eggplant and broccoli seeds and I hope I can do some starts of squash and cucucmber too. I wasn’t sure when I needed to plant them so thanks ALOT! Have you ever grown the heirloom tomato that is called Traveler? I planted a few last year just for the novelty. For those who don’t know each tomato looks like a clump of tiny tomatoes that have grown together. The name is supposed to come from this tomato being taken by travelers who could then just pick off one of the tomatoes as they wanted. The description said the taste wasn’t the greatest, and it wasn’t. Actually this tomato is very very sour but it certainly did stimulate some questions from people who saw it growing. Jarod, I have never grown the Traveler tomato, but I have seen them, and they certainly do look strange. I didn’t realize that they tasted so sour, though. We’re particularly fond of the brown or chocolate type tomatoes. 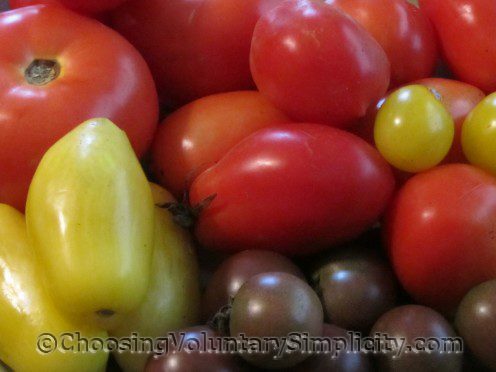 What is the long yellow tomato in the photo, please? It looks too long to be a Roma. I was thinking I would like to try this kind if you could tell me what it is. Lizzie, the long yellow tomatoes are called Banana Legs. They had a really nice taste, although not as nice as some of the other yellow tomatoes we have grown. This will be very helpful. Thank you!